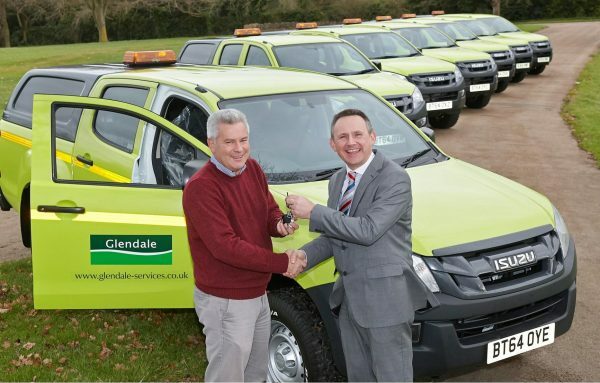 The Isuzu D-Max was the only choice when green service solution supplier Glendale needed a fleet of 25 vehicles with excellent abilities to help fulfil a new contract. The firm had won a tender from Western Power Distribution and needed the fleet at short notice. Isuzu rose to the challenge and delivered 25 D-Max pickups with a high spec level along with corporate decals and wrapping as well as off-road tyres. Isuzu’s fleet operations manager, Alan Able, said: “The Isuzu D-Max is the vehicle of choice for Glendale and we know they have high expectations for quality, economy and reliability of its fleet. When it was launched in 2012, the Isuzu D-Max impressed many in the industry with its excellent levels of ability, especially off-road, and high levels of fuel economy. Most owners should be able to get around 39mpg on the combined fuel cycle. The pickup went on to win various titles for being the best pickup truck that year from a variety of publications. Buyers interested in the Isuzu D-Max can opt for three bodies; there are single and double cabs as well as an extended cab version and prices start at just £14,749. Fitted with the firm’s excellent twin-turbo 2.5 litre diesel engine, the Isuzu D-Max will produce 163PS and has 400Nm of torque – offering great abilities in a variety of environments and can tow 3.5 tonnes as a class leading capacity. The Isuzu D-Max comes with a warranty of five-years or 125,000 miles and the pickup proved popular with the road testing team at commercialvehicle.com who gave it an impressive five stars out of five. Our testers praised its excellent handling levels and wide choice of models while also acknowledging that it managed to win over a large fan base for its abilities after being launched.